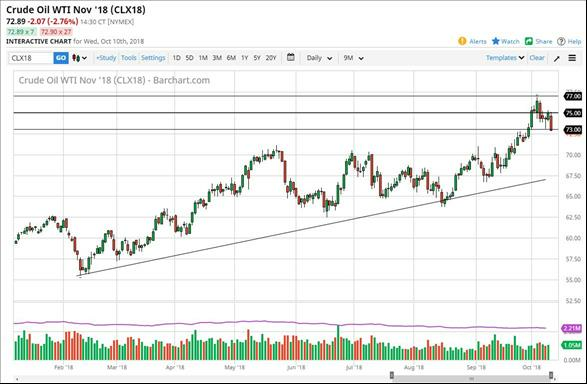 The WTI Crude Oil market was absolutely hammered during trading on Wednesday, as global markets sold off to anything remotely close to being risk appetite induced. What was truly negative is slicing through the $73 level. That was an area that offered a significant amount of support recently, as we formed a hammer from a couple of days ago. However, slicing through the bottom that hammer is a very negative sign and I think that we are ready to drift a bit lower. At this point, I think it's probably best to step on the sidelines and wait for the market to show signs of stability. While the selloff has been rather vicious, it has been an asset after asset bloodbath. In other words, you could sell crude oil, but there are still going to be issues of supply, which means that there will be buyers underneath. It's probably best to step away. Natural gas markets tried to rally again during the day on Wednesday but turned around to form another shooting star like candle. This is a market that has been a bit overdone as of late, and after the candle stick for the trading session on Wednesday, I have become even more convinced that we will probably see a bearish pressure enter the market for the short term. Granted, we are at the beginning of bullish seasonality, so it's only a matter time before buyers return. I think in the short term though, it's very likely that we see a bit of a drop. Overall, I believe that we will probably go looking towards the $3.25 level, possibly the $3.20 level after that. I think short-term opportunities are showing up for or sellers but be very cautious and recognize that it's only a matter of time before we turn around.